SEATTLE--(BUSINESS WIRE)--Sep. 27, 2017-- (NASDAQ: AMZN)—Three years ago, Amazon introduced Echo and Alexa, offering a new way to interact with technology using just your voice. Today, Amazon introduced the next generation of Echo: the all-new Echo with a new design and improved sound for just $99.99, and Echo Plus with a built-in smart home hub for just $149.99. Echo combines an all-new speaker architecture, a dedicated tweeter, a 2.5” down-firing woofer, and Dolby processing to deliver crisp vocals and dynamic bass throughout the room—all in a smaller design and at an even more affordable price. Alexa can play music from leading services like Amazon Music, Pandora, Spotify, iHeartRadio, TuneIn, and more. 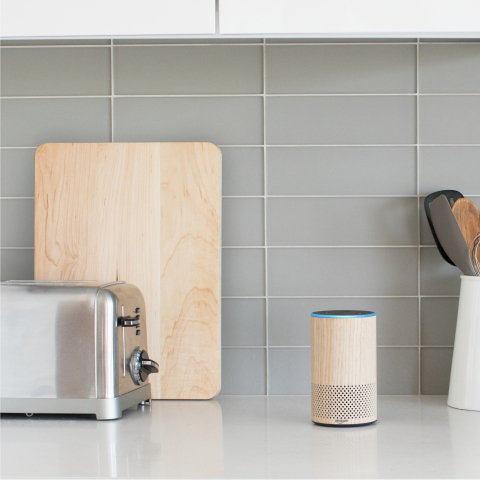 The new Echo uses Amazon’s second generation far-field technology, which features better wake word processing, improved beamforming technology, and enhanced noise cancellation. The Echo far-field technology works to detect the wake word from across the room even in the noisiest parts of your home. Echo Buttons are new devices that deliver ways for customers to play games with friends and family using Alexa. The buttons illuminate and can be pressed to trigger a variety of multiplayer and interactive game experiences. There will be a number of new Echo Button-compatible skills available this holiday season including Trivial Pursuit from Hasbro, Sounds Fun with Mike Epps, Buzzer Beater Basketball Trivia with Karl-Anthony Towns, Fourth Down Football Trivia with Philip Rivers, Full Count Baseball Trivia with Buster Posey from Ground Control, as well as Beat the Intro from Musicplode. Echo Buttons will come in a two-pack, priced at $19.99, and will arrive in time for the holidays in the US, UK, and Germany. Echo Buttons are the first of many Alexa Gadgets, a new collection of accessories that enable fun and playful Alexa experiences. Sign up at https://www.amazon.com/AlexaGadgets to receive notifications and updates when Echo Buttons are available for purchase. Tens of thousands of developers are building skills for Alexa using the Alexa Skills Kit, and today there are over 25,000 third party skills available for Alexa. Skills add even more capabilities like ordering a pizza, requesting a ride, tracking your fitness, controlling your TV, and more. The all-new Echo is just $99.99. It is available for pre-order starting today at www.amazon.com/echo and will start shipping next month. Echo Plus is just $149.99. It is available for pre-order starting today at www.amazon.com/echoplus and will start shipping next month. To help get your smart home started, Amazon customers will receive Philips Hue smart lightbulb with every purchase of an Echo Plus while supplies last. Echo Connect is just $34.99 and will be available later this year. Learn more about Echo Connect at www.amazon.com/echoconnect . Amazon also today introduced the all-new Echo Spot which features a stylish, compact design with a screen so Alexa can show you things for just $129.99; and the all-new Amazon Fire TV with 4K and HDR for just $69.99. The Echo Buttons have not been authorized as required by the rules of the Federal Communications Commission. This device is not, and may not be, offered for sale or lease, or sold or leased, until authorization is obtained.